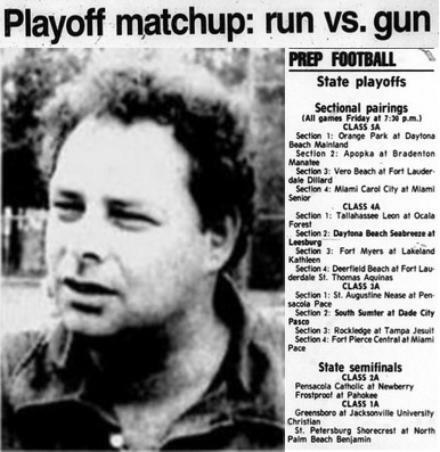 1992 Varsity Football Head Coach Ed Hoffman, State Playoffs, December 4, 1992.
game (led by all state tailback Oran Singleton) and keep Seabreeze from making big plays. only allows 47 yards passing per game and has given up only 47 points in 11 games. KEY INJURIES: Neither team reports any. SPEAKING: "I look at it as we can drive the ball and they can't. But they can pass, and that's dangerous.